Everyday Food Made Simple: NEW THRIVE Foods ~ Emergency Supplies ~ Rotation System! 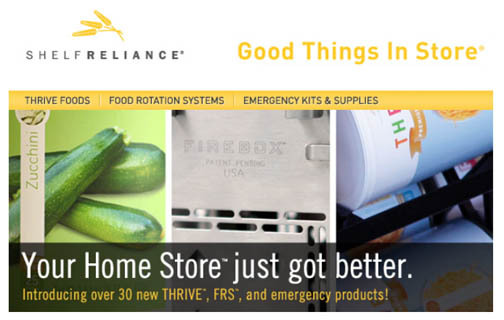 NEW THRIVE Foods ~ Emergency Supplies ~ Rotation System! You can now start ordering our brand new Shelf Reliance® products. I'm SO excited about the new THRIVE, FRS, and emergency products and I know they will help you build an even better Home Store. Click here to learn more about the new products and to view an announcement video from the members of the Shelf Reliance executive team. Here are the 5 NEW THRIVE items: Apple Sauce, Green Bell Peppers, Diced Tomatoes, Red Grapes, and Zucchini!